Since moving from New York State, I could no longer attend meetings at my former club, The Monroe-Woodbury Rotary Club, and so I joined an e-club, The Rotary e Club of the Southwest USA. Our membership extends around the world, including USA, Mexico, Japan, Nigeria and many other countries. Our meetings are online, which I have grown accustomed to. Originally, I missed face-to-face meetings and physically working on projects together, but now it is nice to be able to attend meetings from home, sometimes signing in at midnight in my pajamas, and meeting Rotarians from around the world (The meetings are asynchronous, being posted every Monday, with a requirement to attend by the following Sunday night). I don’t know where my mind was, but right before I went to visit my friend Martha in Puebla, I suddenly realized that my club was donating to a project there, and so I contacted the club president Mónica and arranged for me and Martha to visit them and see their project. First the backstory – Last year there was a conference called the Mexico-USA Friendship Conference. Clubs would gather in Acapulco from the USA and Mexico and proposals for projects would be presented. Each club attending could decide which projects they would help support. Since I already live here, it was decided that I would go to represent our grants committee. Well, 18 projects were presented, I asked many questions and took copious notes, then conferred with my committee via phone and email and we picked three projects to support. One of those projects was The First Eye Bank in the State of Puebla (The 6th Eye Bank in Mexico). And once their Global Grant was approved, we sent them our donation. The Rotary Club of Puebla Campestre Real is quite a dynamic little club, composed of 30 members – all women. Because they did not meet the day I was there, we met at the hospital which would be the recipient of the grant. We met at the Hospital General de San Andrés Cholula, Puebla. Currently, there is neither a public nor private eye bank in the state of Puebla. All analyzed corneas in the private sector are bought from United States eye banks. Without special facilities, those corneas are only good for 24 hours. In addition, there is a lack of public education about organ donations, with people being afraid to become organ donors. The global grant will provide a speculum microscope which will allow the specialists to examine donated corneas to certify that they are suitable for transplant. The grant will also provide medical instruments for cornea care, medical instruments for cornea transplants, a refrigerator that will enable the corneas to be stored for anywhere from 7 days up to a month (depending on the quality of the tissue) before transplantation and an information and awareness campaign about donation and transplants to the community, schools and hospitals. Doctors in other facilities will be taught to do transplants and the public will be educated about transplantation. As in the United States, there are many scary stories and misconceptions regarding organ donation and transplantation. With this grant, the number of cornea transplants, donors and beneficiaries will increase in Puebla, the surrounding areas and nearby states. Here we are with some of the educational posters. Many times children are the ones who needs transplants, or maybe one of the family members are in need. In this case, there are ways to make it seem less scary for them. Here, Dr. Marcela Tejeda Mondragón is holding teddy bears which help to demonstrate transplantation to children. Notice that each bear has a leg “transplanted” from the other. This type of explanation will help make the procedure more understandable and less frightening. After the tour we met with some of the hospital personnel for questions and answers and to express our gratitude for the work they are doing and will continue to do for the community. President Mónica Maribel Flores, members of the Rotary Club Puebla Campestre Real and myself with hospital personnel, including Director General of the Hospital of San Andrés Cholula, Puebla, Dr. Francisco Javier Enríquez Reyes (in the pink shirt), and Dr. Marcela Tejeda Mondragón. After the tour, Martha and I were treated to a nice meal at a very fancy restaurant (no prices on the menu!). We had a wonderful time getting to know each other better in a very pleasant setting with excellent food. I also met Valentín, a French exchange student whom they are sponsoring. All in all, it was a wonderful experience, Martha and I made new friends (hopefully, she will consider becoming a Rotarian…) and I look forward to returning to Puebla in the future. Greetings once again. Today I will focus on a building that we visited whose inside walls are covered with depictions of the life and history of this area of Mexico. Since I mentioned the volcano Popocatépetl, I will begin with that. Popocatépetl is the active volcano of Puebla and next to it is the extinct volcano of Itzaccihuatl. Both names are from the Nahuatl language. To the ancients, Itza resembled a sleeping woman, as seen in the picture below. And so the legend sprang up that Itza and Popo were once human beings. Popo was a warrior and Itza was a princess, and they fell in love. Itza’s father would not grant permission for them to marry until Popo had proved himself in battle, and so the warrior went off to prove his worth to his beloved’s father. While he was away, a rival told Itza that he had died, even though he was still alive. She died from a broken heart, and when Popo returned victorious, he was devastated to find that his love had died. 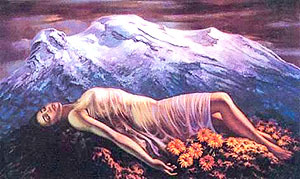 He took her body into the mountains in order to build a funeral pyre so that he could die beside her. The gods took pity on them and turned them into the volcanoes so that they could be together forever. Another section of the murals shows a traditional Mexican altar. The person they are honoring is Javier Solis, a popular mariachi singer born in Metepec Atlixco. He also sang other types of songs, was an actor and was the third member of the Tres Gallos Mexicanos (Three Mexican Roosters), the other two members being Jorge Negrete and Pedro Infante. The workers of Atlixco demand justice . Death to the assassins! This mural is in honor of the workers who gave their lives in the factories. Who suffered the injustice and assassinations with impunity. It is also an allegory of the idea of freedom. And a recognition of the working women. There were also scenes of landmarks and daily life in Atlixco. And one event which I was fortunate to witness – the voladores. These men would climb a very high pole. At the top was a small platform on which a man would stand and play music. The other men would tie ropes to their legs and slowly twirl about the pole, getting closer and closer to the ground, until they were standing on the ground. It was dizzying to watch, and I admired their lack of fear. I know that I would never be able to do what they were doing…. The battery on my phone was extremely low, so by the time I turned it on and started to shoot the video, I did not catch the performance from the beginning until the very end. There were so many murals depicting myths, pre-Hispanic life and landmarks of Puebla. It would take so much more space to go into detail about every one, so I will simply put up the pictures with brief descriptions as indicated. This depicts the pyramid, which I did visit, which was from pre-Hispanic times. Originally, there were eight pyramids, with each one being built covering the previous one. Erosion destroyed numbers 6, 7 and 8, so that the original 5 pyramids remain. And so I will end this post now, and try to write up and publish the next one in a more timely manner. Adios ! When I lived in New York, one of my friends was a Mexican woman married to an American. Her name is Martha, and in January, she messaged me that she was in Puebla visiting her mother, and invited me to come over and stay with her for a few days. Thinking about the cheapest way to go, I considered the bus – until I found out that it was about a 13 hour ride. One friend suggested that I fly into Mexico City and then take the bus to Puebla, which I did. Returning home, it was only a 40 minute ride to the bus station, a 2-hour bus ride to the airport and a 90 minute-or-so flight to Colima Airport. Getting there, however, was quite an adventure. My 4:25pm flight from Colima left at 6pm (good thing I didn’t have to catch a connecting flight, and the reason I usually plan for several hours of overlay between flights when I do) and the 8:15 bus, I was told, would be delayed until 8:50p because of traffic. A baggage handler took my suitcase, and I took the opportunity to go to the bathroom and get a bite to eat. Returning in plenty of time, I waited for my bus, only to be told that it had already left with my suitcase. However, there was room on the actual 8:50 bus, and when I got to the station, my suitcase was waiting for me. Whew !!! I felt really bad for Martha, as we didn’t finally arrive at her home until midnight, but she assured me she was ok because her brother had accompanied her. After a good night’s rest, I was ready to explore Puebla. We did so much exploring during the three full days that I was there that my time will be detailed over several blog posts. Firstly, the rural area where my friend lives is called Atlixco. It is pronounced Aht-lees-ko and when said, sounds very much like Jalisco (ha-lees-ko) – one of the states that borders Colima state, where I live. So it was very confusing when I heard people say the name, and I would wonder why they were talking about Jalisco. Atlixco is a designated Pueblo Mágico, or magic town, which means it is deemed to have cultural, historical, gastronomical or natural treasures that are exceptionally special and meaningful to Mexico’s heritage. These are always wonderful towns to visit, and I will get into all the details in upcoming posts. One feature of this area which is evident wherever you are is the volcano Popocatépetl. This volcano is continuously active and stands at 5426 meters (17,802 feet). This is higher than the two volcanoes in my area – the Volcán de Fuego (Colima Volcano) at 3839 meters (12,595 feet) and Volcán de Nieve (Nevado de Colima or Volcano of Snow) at 4260 meters (13,976 feet). It was really quite impressive, and when I say it is continuously active, that means there was a non-stop plume of smoke arising from the caldera. And while Colima is an agricultural state known for coffee, bananas and sugar cane, the economic backbone of Puebla is the floral industry, growing flowers for export. One of the first places we visited was a bonsai museum. In Japan, a man by the name of John Naka taught many people the art of bonsai, and many of his students then settled in other places continuing to teach others this art. A man named Emigdio Trujillo Sanchez learned this art from maestro Chen in San Francisco and maestro Yamaguchi in Los Angeles. The process of creation of a bonsai is not mechanical; a bonsai cannot be created simply through pruning and the wiring of branches, following rules and rigid conventions. Actually it is a long process that begins with an idea, born perhaps from a subliminal vision from the sight of a tree in its natural habitat and ends with the complete transformation of an ordinary plant or tree in a spectacular work of art, which is capable of evoking feelings of beauty, grace and greatness. The Penzai originated in China. There is evidence from the year 2000 B.C. that the Chinese cultivated plants in containers as part of their usual gardening. They were perhaps one of the first civilizations together with the Egyptians and Persians that practiced the sophisticated art of gardening. As a result of his interest and studies, he created the Museum of Bonsai and the Mexican School of the Art of Bonsai. The outdoor museum holds about 200 samples of trees between 20 and 100 years old. Periodically, the school also invites international teachers of bonsai who give demonstrations and classes. And so ends today’s blog post. More next time as my adventures continued in Puebla. Recently, I have increased my knowledge of quite a few things, from way back in history up to the present time, which just goes to show that no one knows everything and there is value in questioning the origins of cultural practices, even if you’re pretty sure you know the answer – many times you will be surprised that you actually don’t know the answer at all. I lived in New York for 66 years before moving to Mexico, where I have been living for the past 3 years. Having lived in New York, I was aware of Groundhog Day and what it means if the groundhog sees his shadow or doesn’t see it. Here in Mexico, I was introduced to the experience of Candelaria. Upon researching it, I now have a greater understanding of the origin of Groundhog Day, which has nothing to do with animals seeing their shadow. And so, I will start this post going way back to celebrations of February 2nd before animals were a part of it, and continue the thread right up to the present day Mexican celebration. February 2nd marks the halfway point between the winter solstice and the spring equinox. The ancient Celts celebrated this time with the pagan holiday of Imbolc, heralding new beginnings with the upcoming birth of new livestock and planting of new crops. For Christians, February 2nd is 40 days after Christmas Day. The tradition is that women were considered unclean for 40 days after giving birth, and so Mary, Joseph and Jesus would have gone to the temple on that day for Jesus to be blessed and for Mary to be purified. This date is referred to as Candlemas by Christians. There are variations of this poem in Scotland, Germany and, of course, the United States. Of course, if the day is “fair and bright” any animal will cast a shadow, foretelling winter having “another flight” and if there are “clouds and rain,” then there will be no shadow and “Winter will not come again.” In Germany, a badger was watched for a shadow and in Pennsylvania, USA, the groundhog is the animal of choice. The Mexican version of Candlemas is Día de la Candelaria. Preparations actually begin on January 6th, Three Kings Day. On this day, people get together for parties and to eat the Rosca, a pastry which has a small figure of a baby cooked inside. Whoever get the piece of Rosca with the figure must then host a celebration on February 2nd and provide tamales for everyone. What is the meaning of the Rosca of the Kings. January 6th. The dried fruits are the jewels in the crowns of the kings that signify peace, love and happiness. The form symbolizes the Love of God that has no beginning and no end. The hidden boy remembers the moment in which Joseph and Mary hid the baby Jesus to save him from Herod. Eating the bread is related to communion with Jesus. Tamali comes from the Náhuatl word “tamalli” which means “wrapped.” Náhuatl is one of the indigenous languages of Mexico. Tamales are made with corn dough, either plain or with meat, fruit or other ingredients added, then wrapped in a corn husk and steamed. I have been told by my neighbors that tamales are eaten because they are the traditional food from the time of the Aztecs. Besides eating tamales, we drink atole, which is a hot drink made from corn. During my investigation, I also read that according to the Aztec calendar, our February 2nd is also the date that the assistants to the rain god Tláloc were honored. Meanwhile, Buen Provecho and see you next time….. If you are an ex-pat, especially if you are living in a country where English is not the official language, I strongly urge you to find and attend a Death Café meeting. No, it is not a brand of coffee, nor does it have anything to do with Day of the Dead. Rather, it is a way to gather essential information in case you die or expect to be buried in a country that is not the country of your nationality. I am going to talk about this in general, since requirements probably vary from country to country, along with some specifics about Mexico, since that is where I live. The people speaking at this gathering were from a local funeral home. This was good, because they could give us information about what documents were necessary in case of death, who would be responsible for signing a death certificate and what arrangements would need to be made with the deceased’s body. This is important information which may vary from country to country; in Mexico, the body needs to either be buried or cremated within 24 hours of death. Up until this point of the meeting, I thought I was covered – I paid for a plot in the local cemetery, I have both an American and a Mexican will, and I have designated beneficiaries in all documents that require beneficiaries. As the meeting continued, I realized that I was woefully unprepared and need to do a lot more work and investigation before everything is actually in order. First order of business to consider, in a country whose official language is not English, is to have important documents translated into the official language of the country. Birth certificate, marriage certificate, divorce decree, all must be translated into Spanish by a certified translator here in Mexico. If you use a different name than the name on your birth certificate, you need to find out if that will cause problems in your adopted country. Here in Mexico, your birth name consists of: Your given first or first and middle name, your first last name (apellido) is your father’s last name and your second last name is your mother’s last name. An example is: John Jones and Sarah Smith have a daughter. They name her Mary Katherine. Her full name will be Mary Katherine Jones Smith. That will be her name throughout her entire life, even if she marries. So all documentation from birth through death will have the same name for her. In the United States, probably most women take their husband’s last name when they marry. Even after divorce, they have a choice to keep that name or change it back to their maiden name. And here, after death, it will cause major problems if your birth certificate name does not match the name you have been using, since the primary document they use will be your birth certificate. I am currently trying to discover a way to reconcile these facts so there will be no problems after I am gone. I can update my blog with new information as I discover it, but currently I believe that a justice of the peace can legally resolve the issue. There are two types of legal counselors with which I am familiar here: notarios and justices of the peace. Notarios are not the same as U.S. notaries. Notarios are lawyers and can draw up documents, such as wills, but their documents, such as name changes, might not be accepted by all officials. Justices of the peace can also draw up documents, such as name changes, and their documents are accepted by officials. They may also charge less for their services, which is an added benefit. Also to be considered, what documentation do your family members need to prove they are your family. I am continuing to investigate the particulars about Mexico and the U.S., and, as I stated before, rules and regulations may vary according to country, so this post is less about specific details and more about giving a nudge to those who are ex-pats or snowbirds to investigate what you would need to know if you should give your last breath while outside of the country in which you wish to be buried. Better to be prepared than to leave your loved ones to deal with a bureaucratic nightmare involving two countries while in the midst of their grief. Until next time – ¡Adiós! To finish up my Day of the Dead week in Tlaquepaque, I visited a pottery museum. While there, I heard the distinct sounds of music and dancing and discovered that a group of school children were practicing for a performance that would be held a few days afterwards. In the meantime, I continued to view the many marvelous works of the museum. This post will consist mainly of photographs with a little bit of commentary, and so I present for your enjoyment the many works of art which I viewed. Basically, he created the Catrina’s as political satire, i.e. – no matter how pretentious you act with fine clothes, etc., eventually we all end up in the same place, 6 feet under. Besides this display, there was a darkened room where a woman explained the history of Day of the Dead. On the altar were pre-Columbian figures, including a bust of a pre-Columbian man with feathered headdress. I wish I could have taken a photo, but it was too dark for that to happen. There were no lights on in the room except for candles on the altar. All in all, it was a wonderful experience, learning about the history as well as all of the art work and altars. And so I will end this post here, and wishing you a safe and warm week. Greetings! and welcome to 2019. I am first going to go back to 2018 and Day of the Dead, probably stretching this over 2 or 3 posts. I was going to write about it in a more timely manner, but I had to prepare for the Rotary Mexico-USA Friendship conference, and afterwards write up everything I learned and submit it to my grants committee, and then we had back-and-forth discussions and meetings. Before I knew it, it was time to write about Christmas, so I decided to save it for another day. New Year’s Eve and Day has come and gone, so naturally I had to write about that, and as I was preparing to finally catch up this past week, I had a 12-hour migraine and was bedridden. Of course, once the pain was gone, it was time to go to bed. After being in bed for almost 24 hours, I woke up three days ago in severe back pain, barely able to walk. After taking Motrin and trying to ride it out, my neighbor took me to a clinic yesterday, and after injections of steroids and an anti-inflammatory and sending me home with anti-inflammatory pills, I am better and at least able to walk around the house. Warm compresses and Arnica gel are also in use and a girdle for support (hadn’t worn one of those since I was 18, and never thought I would again). So, with all that, I missed the last few days of our 9-day celebration of the Virgin of Guadalupe, including the dancing and fireworks from the Castillo – a very tall tower loaded with fireworks which are set off one layer at a time. Oh, well, since I am a permanent resident, I have seen it before and will see it again. If the Easter tradition continues, I will see the Castillo for the Easter celebration in a few months. Besides, it is so loud that I heard all the music and fireworks from inside my house. March 6th was Three Kings Day, and since I had the plastic baby Jesus in my piece of cake, I get to give tamales to everyone on February 2nd, so I will save my post for Three Kings and combine it with Tamale Day. And now, on to the Day of the Dead. I had been planning to see one of my friends who lives in Guadalajara for Day of the Dead. However, the Mexico-USA conference was just ending two days after the start of those celebrations, so I missed the first day, and ended up missing the final day as I was going to be in transit back to Cofradía. Once again, there’s always next year. When I visit Guadalajara, I stay in a town called Tlaquepaque – a town of many artisans, museums, restaurants, stores with all kinds of alcohol and sweets, and outdoor statues everywhere. Also every kind of craft you can think of from pottery, ceramics, paintings, etc. I decided to walk around and scope out all the activities, and came upon face painters and decided, why not get my face painted. After all was done, and I had picked out a head piece of flowers, I realized that my white hair actually added to the illusion that my head was now just a skull. One thing, once I was in full Día de los Muertos mode was all the attention I received from tourists. I can’t count the number of people who asked to take my picture, or asked to have my picture taken with them. Nice little ego boost there…..
Of course, I was taking plenty of pictures myself. One couple asked to be paid for taking their picture, so I did – just a few pesos so it was ok – not like what you hear stateside of some actors or athletes expecting a lot of money for an autograph or photo. Maybe next year I’ll bring along a skirt so I can totally fit in. There was also a young girl who graciously posed for a photo and did not ask for a tip. However, I was in a coffee shop at the time enjoying a coffee and something to eat, and I got the impression she was the daughter of the owner. Of course, there were innumerable Catrinas – statues of elegantly dressed skeletons -, skulls, altars to the dead – more than I’ve ever seen at one time. Of course, this celebration is not only about dressing up as skeletons. It is about honoring those who have passed away before us. Altars are erected with flowers, paper flags, and the favorite food of the deceased. Photos are also placed on the altars, and candles, and a cross of salt at the base to purify the soul. When I first came down to Cofradía de Suchitlán before making the final decision to move to Mexico, I stayed in the volunteer’s residence of Project Amigo, a literacy project for which I had volunteered since 2012. I was told it was a good idea to live here for 6 months before making a final decision, since living here full time and volunteering one week per year were two totally different experiences. Well on February 22nd, 2016 – one month and 12 days after I arrived, my mother died of a stroke in Maryland, USA. It was difficult for me, since I had not been there and it was sudden, so I had no idea it would happen. All of the students got together when they heard and erected an altar to my mother. My sister had sent me two photos of her – one recent and one taken in 1948, the year she married my father. So the students had misunderstood and put her birth and death years as 1948-2016, but that just adds to the uniqueness of this altar. The cross of salt is at the base and the flag and symbol for Ukraine is behind the cross, since she was Ukrainian. The paper flags (papel picada) were also made by the students in the colors of Ukraine – blue and yellow. The students also brought food and fruit, and I put out chicken, potatoes and beer for her. Doña Meche, a local shop owner, brought the white lillies. This gives you an idea of how caring the local people are here and why I consider myself at home now, even though I am in a different country from my prior life. It was a fairly hot day, and had also rained for a short time. Since my friend Claudia could not join me until she got off from work, I went back to my hotel room to decide whether or not I should take off the makeup, eventually deciding that it had been on all day and it should be washed off, although I was sorry to see it go. And so, when Claudia arrived, I was bare-faced and ready to go out again. In the evening, there were street actors like these two guys. After the photo was taken, I had totally forgotten that I still had their hat on as I walked away and was startled with by a tap on my shoulder, and sheepishly gave them back their hat, apologizing profusely. There were many other street actors, but by that time it was dark and I would not have been able to take photos which would have done them justice. And so I will end this post here, and in my second post describe the pottery museum that I visited and the beautiful celebration of Día de los Muertos that was held there in the evening. Until next time – nos vemos! November, December and January are very busy months in Mexico as far as celebrations go. There is Day of the Dead November 1st and 2nd. Then we skip to December – the 12th is the official Feast of the Virgin of Guadalupe. December 24th and 25th are Christmas Eve and Day, then New Year’s Eve and Day. Besides the official December 12th day to celebrate the Virgin, each village has their own week to also celebrate. This morning, at 5am sharp was the start of our week. A band playing music, church bells, and, of course, firecrackers. At 5am, and, I believe, also 5:30 and 6am. I kept falling back to sleep so I cannot be sure if it was 5:30 and 6 or 5:30 OR 6am. This will be repeated another 3 times, and then start all over until the end of the final day – January 12th. Oh, and I almost forgot, January 6th is Three Kings Day, AKA the Day of the Three Magi. But that will be a story for the near future. Today, I will concentrate on two days – New Year’s Eve and New Year’s Day. New Year’s Eve began, as most holidays, with a Mass at the Catholic Church. We then retired to Lourdes’ house for a dinner. She put together 2 long tables in her garage – actually more of a driveway between the walls of her house and the house next door and a roof above it. Since alcohol is like a sleeping pill for me, I had a glass of wine instead of tequila and a glass or two of Coca Cola along with the food. We all had a lovely time eating and talking and waiting for the approach of midnight. At midnight, we heard the church bells and fireworks, and then Lourdes’ husband brought out a big birthday cake, since January 1st is her birthday. We sang the birthday song, and a few minutes later, I heard a band approaching. Unbeknownst to anyone else, her husband and son arranged for a brass band to come and serenade her for her birthday. The band members set their instruments up at the foot of the driveway in the street and began to play. And they were LOUD!!! But then, that is how it is here. Many nights I listen to music from one house or another – so loud you really can’t tell which house it is coming from – or what street, for that matter. After the birthday song, they continued to play, and by 1:30am I was ready to go to sleep. They were still playing as I left and I could hear them from my house on the next block, but that didn’t keep me from falling asleep. The next day, we went for lunch to a nice restaurant, where I had never been before in Montitlán called La Cabaña de mi General. Very nice landscaping and very good food – not too spicy, but lots of meat. and then headed back downstairs to eat. After the meal, the day wasn’t over yet. We then headed over to a park called Laguna Carrizalillos. I had often passed a sign for that place while driving, but had never been there. It is a very large park, with areas for camping, a large lake for boating and stands where people sell food and drink. There was also an area with swings and other equipment for children to play. Across the lake was a beautiful view of the volcano, and on our side many strange trees. In the United States we are used to seeing daisies as flowers in the ground, but here they were growing on trees. And so ends my story of New Year’s Eve 2018 – the end of one year and the start of another, hopefully bringing good things to all. Not as exciting a holiday as some may have had, but very pleasant and definitely different than any other that I have experienced. Until next time – Wishing everyone a happy, healthy and safe New Year! Christmas! For many people it conjures up images of snowy landscapes, people bundled up against the cold, fires crackling away in fireplaces, and creches with the Holy Family surrounded in a manger by animals and the Three Wise Men, with an Angel and Star above. Of course, in different parts of the world, and in different cultures, you will find variations of the common theme, and here in Mexico that is no different. Halfway down the Pacific coast of Mexico, you will only find snow on the top of our inactive volcano when the temperature drops. Second, what would any holiday or celebration be here without firecrackers and fireworks. Beginning around the time of the celebrations of the Virgin of Guadalupe, there was a tent set up to satisfy everyone’s needs for pyrotechnics. And given how everyone, including children, take part in setting them off in the streets, I am surprised that I have not heard of anyone blowing off or burning their hands or faces. As in the United States, we are beginning to see Christmas decorations way before we should be seeing them. I believe this year, we started seeing them the end of October, beginning with a great big decorated and lit Christmas tree at the entrance to Sears in the Zentralia mall in Colima. And I did my part with a wreath on my door and outside my gate, a tiny bonsai-sized Christmas tree, decorations on my porch and fruit trees and lights hung from my car port. One difference from Christmas in the U.S. is that, since December 25th is Jesus’ birthday, in the depictions of the Holy Family, Baby Jesus is kept covered until after midnight on December 24th. In our little village of about 1500 people, we have two Catholic Churches and one 7th Day Adventist church. Both Catholic churches were being readied for Christmas mass, the evening of December 24th, also known as Noche Buena. I was told by my friend Lourdes that Mass would be at 6pm, but I found both churches empty when I arrived at that time. I asked two different people in the street and one woman told me that Mass would start at 7pm and another told me 8pm. I called Lourdes, who informed me that the priest would be late because he was performing a wedding. I consoled myself with the fact that the church bells always ring a half hour before the Mass begins, so I went to a neighbor’s house and then my own house to wait. And at 7:30pm, the church bells started to ring. Now the problem was – in which church was the Mass? So I began by going to the church closest to my house and that happened to be the correct one. (It wouldn’t really matter much if I’d picked the wrong one first as the two churches are one block from each other on parallel streets). And so I entered the church with my neighbor and before very long it was packed with the citizens of Cofradía. Once we were seated, there was a procession of a girl dressed as an angel and Pastores coming in dressed in various costumes and carrying banners. After the Mass, two of the Pastores were holding dolls depicting Baby Jesus and the parishoners went forward, kissed one of them and then exited the church. After Mass, I celebrated at Lourdes’ house with her family. We had a nice meal of stuffed turkey, salad, mashed white potatoes, lots of wine and my contribution – mashed camote (a Mexican version of the sweet potato) with butter and nutmeg. We exchanged gifts and I was home by midnight (the advantage of living only a few houses down the street). Of course, there were also fireworks after Mass, continuing even now, the end of Christmas day. Before going to bed, I did take the cover off Baby Jesus, as tradition dictates. In the morning, I was fortunate to witness another tradition of the area with which I had not been familiar. I went to Lourdes’ house in the morning for coffee, and after a while, she said Los Pastores were coming. I went out to her porch and saw a parade of people coming down the street singing. They turned the corner and then came back around, passing the house, but said they would come to Lourdes’ house after they had been to the others. What happens is that people bring out their Baby Jesus dolls/statues and Los Pastores will sing in front of them about the joy of the birth of Jesus. And so Lourdes had her Baby Jesus brought out to the porch and we waited. As you can hear at the end of the video, the “priest” also says “Merry Christmas” and Lourdes’ husband Alfonso says “See you later.” No matter how good my Spanish becomes, I will never be mistaken for a Mexican. My face immediately gives it away. Some Mexicans will speak Spanish to me to see how well I speak, and some will either want to practice their English or be polite and immediately start speaking English, even at times when I WANT to speak Spanish. Well, we have come to the end of my Christmas story. For all of you who celebrate Christmas, I wish you a very Merry and Blessed Christmas, and for those of you who have other religions and traditions, I wish you a Blessed Holiday Season. Mexico is a Catholic country and the Virgin of Guadalupe is the patron saint of Mexico. Her feast day, December 12th, is celebrated by Catholics in Mexico. In addition, each village in this area has their own separate week to celebrate. Here in Cofradía there is a week-long fiesta in our town square, with church bells, music and firecrackers starting at 5am, repeated every 6 hours, and lasting until one am the next morning. On the night of the final day, a large castillo (tower) is constructed, loaded with row after row of fireworks, which is set off one layer at a time, starting at the base. Our week for celebration is usually some time in January. On December 9, 1531 an indigenous native named Juan Diego was walking through the hill country of Tepayac. He had already converted to Christianity, and on this day, near Tepayac Hill, he encountered a beautiful woman surrounded by a ball of light as bright as the sun. This woman identified herself in his native Nahuatl language as Mary the mother of Jesus. Mary commanded him to go to Tenochtitlan, visit the bishop-elect Fray Juan de Zumarraga and say that they were to build a church on the spot where he had seen his vision. He went to the bishop’s palace, but was turned away by his servants, who told him to come back the next day if he really wanted to see the bishop. When he returned to the spot where he had seen her, he told Mary to send someone else because apparently he wasn’t worthy. She insisted that she had chosen him, and so he returned the next day. During the meeting, the bishop said that he needed a sign in order to believe what he was being told. He returned to the hill, and was greeted by Mary. He told her what had transpired and of the bishop’s desire for a sign. She told him to return the following day and he would have his sign. Unfortunately, he was unable to return the next day, as his uncle had become deathly ill and needed his care. After 2 days, he went out to find a priest, and while passing Tepayac Hill, he encountered Mary again. She told him that he did not need a priest, as his uncle was now cured, but rather he should climb to the top of the hill to gather roses and bring them back to her. The weather was freezing cold, but he went to the top of the hill and found roses in full bloom. He gathered the flowers in his tilma – a cape/poncho made of cactus fiber – and brought them to Mary, where she arranged them and charged him with bringing them to the bishop. He brought them to the bishop, and when he opened his tilma…..
there were not only roses, but his tilma now contained a picture of Mary just as he described her. The bishop then believed him, and the next day brought the tilma to the cathedral, then went with Juan Diego to the spot where he had had his vision. Afterwards he went back to his village and met his uncle, who was now completely well. His uncle told him that he had met a young woman surrounded by light who told him that she had sent his nephew to Tenochtitlan with a picture of herself. She said, “Call me and my image Santa Maria de Guadalupe.” It is thought by some that Guadalupe was a mis-translation from Nahuatl to Spanish of the work Coatlallope which means one who treads on snakes. Here is a photo of the church that was built on the spot where Juan Diego had his vision (in what is now Mexico City). These are the stairs leading to the top of the hill and the original church. This is a photo from the top of the hill, looking down on the old basilica on the left and the new basilica on the right. Here you can see all the pilgrims from around the world camping out on the plaza. You can see the clock tower on the right of the picture. Families come, pitch tents and sleep here at night. Here is the inside of the new basilica. You can see to the lower right of the large gold cross a rectangular frame. Close-ups of the frame. It is said that within this frame is the actual cloak of Juan Diego. I was reading that the church had been subjected to floods, smoke from fires and even in 1921 a bomb which was exploded by anti-clerical forces. It is said that an iron cross was twisted out of shape and the marble altar rail was damaged, but the tilma was completely unharmed. The new basilica at ground level. Here are the older churches. When I visited the first time, I hadn’t realized there are two older buildings. You can see the reason why they are no longer in use and are unsafe to enter – the older one started to lean, much like the Leaning Tower of Pisa. Another view of the older churches from the plaza. Several busloads of us from Cofradía did a pilgrimage there. This is some of us in a procession carrying a glass case with flowers and a statue inside. We also brought with us many bags of produce – fruits and vegetables from this area as offerings. A closer view of the clock tower. You can see the plaza behind it and some of the pilgrims. There are statues of the Virgin of Guadalupe throughout Mexico. This is the Virgin of Guadalupe on my property, cut out of black volcanic rock by a local artisan. There are white roses around her, as it is said she likes white roses. This was for her inauguration, and currently there is wandering Jew as ground cover. And here ends my presentation. I hope you have enjoyed learning about the history of the Virgin of Guadalupe. Until next time, adios!